Day 2 dawned early, and the weather (as it was for most of the day) was amazingly mild. We checked out of the hotel as we were staying somewhere else that night, and headed out of the city of Reykjavik and into the surrounding countryside. The light started to brighten as we moved out to the east, and the weather improved as well, which was a bonus. We made our first stop at the Hellisheidi Geothermal Plant, which takes heat from a volcano and provides hot water for the housing in Reykjavik. We saw a short film and had a tour of the plant, and then headed back to the coach and had an hour's drive up over high fell and with a view towards the coast. We encountered the rocky former coastline, and then pulled up at the Eyjafjallajokull visitor centre that has been built over the road from Thorvaldseyri. On a previous visit, I pulled up to the farm itself and spoke to the farmer and his wife in their home but now it was a film and a good pause for the students to see how the volcano affected people living in the area. 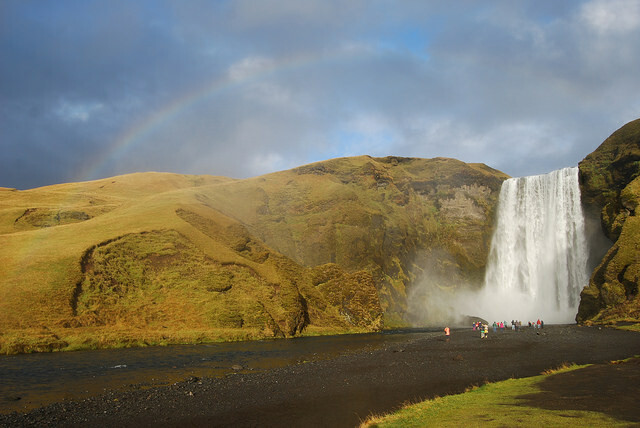 We then moved on a few miles to the curtain waterfall of Skogafoss, where we broke for lunch. The weather was certainly changeable, and we had sunshine as we climbed up to the top viewing platform, and into the spray of the waterfall. Everyone enjoyed the falls, and the surrounding countryside and we were then on for another trip along the coastline before heading inland towards the glacier of Solheimajokull. We were fitted with crampons, and then walked up to the glacier - a longer walk than it used to be as the glacier has receded quite a way over the last few years. 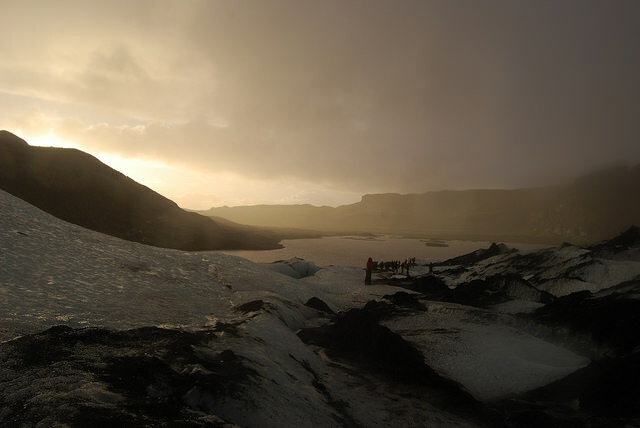 Everyone had the chance to walk on the glacier, and as we came to the end of the tour, the light was spectacular. From the glacier we then had a short drive to Vik, where we were staying. I had a shot time to appreciate the wonderful view from my hotel room before it got dark.